Ronald E. Knop, 63, of E Monroe Street, Port Washington died at his home after a battle with cancer. He was born July 26, 1943 in Port Washington, Wisconsin to Edward and Marie Picciurro Knop. He served in the Army during the Vietnam War from 1964 – 1966. On October 7, 1967 he married Patricia Steenis of Port Washington at St. Mary’s Church in Port Washington. He worked at the Wisconsin Electric Power Plant in Port Washington for 36 years, retiring in 2003 as a Senior Power Plant Rigger Mechanic. He was a member of the International Association of Operating Engineers Local 317 and Employees Mutual Benefit Association (EMBA). Ron kept busy with several organizations. He was a member of St. Peter of Alcantara Catholic Church and was a member of its Building and Grounds Committee along with being a Past President St. Peter’s Men’s Club, Past Secretary St. Peter’s Mens Club for 12 years and past President St. Peter’s Usher Society. He was Past Commander of Van Ells – Schanen American Legion Post 82, Life member of the Past Commanders Club of Wisconsin and Adjutant for Legion Post 82 for 32 years. In addition to the American Legion, Ron was also a Life member of Ozaukee Memorial Post 5373 Veterans of Foreign Wars, Voiture #1330 40/8 and “Bugles Across America”, a group of volunteer buglars for military funerals. 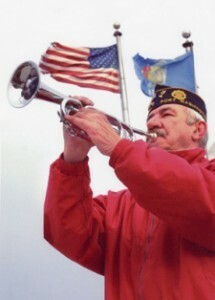 He played “Taps” for many funerals and military events. He enjoyed family and friends, hunting, fishing, watching the Packers and Badgers, NASCAR, cutting wood, playing cribbage and sheepshead, golfing and bowling. He was a member of the John Lake Association, the Lincoln County Sportsmans Club and a faithful member of the “Devil’s Pocket” of Merrill, Wisconsin. Ron is survived by his wife Pat, children Danielle (Kevin) Weins of Oak Creek and Kyle (Sara) Knop of Port Washington and grandchildren Mark and Katie Weins. Further survived by brother Keith ( Ris� ) Knop of Port Washington, sister Kathie (Sheldon) Shaver of Newburg, brother-in-law Hans Werner of Alabama, nieces, nephews, other relatives and friends. Preceded by his parents, in-laws George & Janet Steenis and sister-in-law Suzanne Werner. Fr. Patrick Wendt will celebrate a Memorial Mass of Christian Burial 7 pm Friday, February 2, 2007 at St. Peter of Alcantara Catholic Church, 1800 N Wisconsin Street, Port Washington. Visitation from 3:30 – 6:45 pm Friday with a American Legion and Veterans Of Foreign Wars walkthrough at 6:45 pm Friday. Ron donated his body to the Medical College of Wisconsin. Memorials to the to Children’s Hospital Foundation (5583 Waterford Lane, Suite A, Appleton, WI 54913) for Juvenile Diabetes in honor of Ron’s grandaughter Katie are appreciated.